On the next part of our journey the DC-8 traversed the tropical Pacific Ocean. I have always been deeply fascinated by this part of the atmosphere. The tropical Pacific Ocean lies over very warm water heated by the sun, and it is often considered to be the “firebox” of the atmosphere, the place where vast amounts of energy enter the atmosphere and drive many major features of our weather and climate. The plane crossed two very important boundaries in the atmosphere. 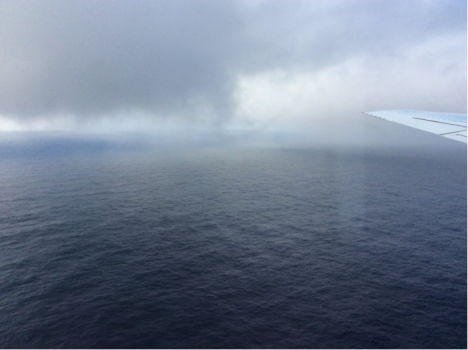 We encountered the first one, the Intertropical Convergence Zone (often abbreviated as the ITCZ), as our DC-8 passed 10 degrees north of the equator on the flight from Kona, Hawaii, to Pago Pago, American Samoa. The ITCZ is usually located north of the equator in Northern Hemisphere summer, and right along the equator in winter. It stands as the great meeting place between the Northern and Southern Hemispheres. Air circulates within each hemisphere in a few months, but it takes roughly a year for air to be mixed between the hemispheres by crossing the ITCZ. I expected our measurements would see very different concentrations of pollutants as we crossed this boundary, with higher concentrations in the north than in the south. And indeed we did. The amount of carbon monoxide (CO), a major pollutant arising from all forms of combustion, dropped abruptly. But the change wasn’t as big as I expected. Other pollutants behaved the same way. The air was very clean in the northern tropical Pacific, so the North-South contrast was muted. But I was in for a surprise a short while later. 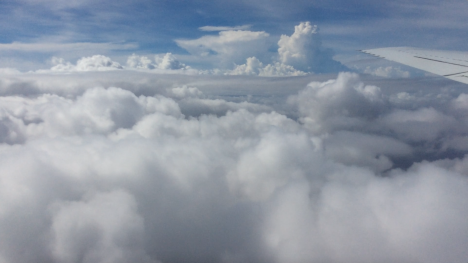 After we had passed the ITCZ, we turned the plane to the east and travelled along the equator. Every time the DC-8 dipped down below about 10,000 feet, we saw strangely high pollutant levels, including carbon monoxide and indicators of fresh burning, such as benzene and fine particles of smoke and soot. Here we were in the midst of fresh pollution, in the Southern Hemisphere where air is supposed to be so clean. We were more than 6,000 miles from the nearest land! Maybe I should not have been surprised. Our atmospheric computer models had actually predicted that we would see these chemicals. According to Junhua Liu, the scientist at Goddard Space Flight Center who generated the forecast, the chemicals originated in South America where fires are set each August to remove weeds and crop residues from agricultural fields and to clear trees in the forest. The goal of our ATom mission is to find out where, and how, pollutants reach the most remote parts of the planet, and we had certainly found a big input in a very surprising place, where very few people have been able to sample before us. We encountered the second boundary, the South Pacific Convergence Zone (SPCZ) on the next flight of the DC-8 from Pago Pago to Christchurch, New Zealand. 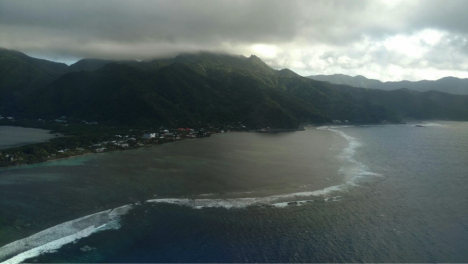 American Samoa is a lush tropical island with craggy mountains covered in jungle and clouds and generally mild weather. All that was about to change in a hurry. The DC-8 climbs steeply away from the tropical island of American Samoa, with its mountains covered by warm clouds. 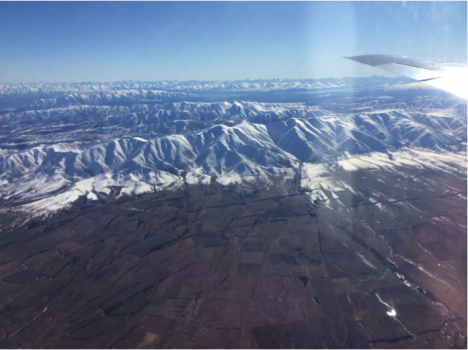 The next land we see on the ATom mission is the South Island of New Zealand, deep in winter. Credit: Bruce Daube, Harvard University. First we came upon the SPCZ. The SPCZ is a powerful, nearly stationary feature of the South Pacific, where cold winter air from the south meets the warm, humid air from the tropics. This front is a continuous band of heavy rain and winds. Embedded in the front is the subtropical jet stream, which had winds over 200 knots (230 miles per hour) and powerful turbulence at its core the day that we were there. Our safe passage and successful sampling required close coordination between the crew and the meteorological team of ATom — Paul Newman of NASA’s Goddard Space Flight Center on the plane, and Eric Ray of NOAA’s Environmental Systems Research Laboratory on the ground. Finally, we approached the South Island of New Zealand. What a contrast to American Samoa! The mountains were clothed in snow. The valleys had been made into tidy farms with wind breaks and agricultural fields. One of the scientists on board, Róisín Cammane of Harvard, thought the farms looked just like her home country in Ireland, although the mountains are bigger. We made a low pass over the famous observatory at Lauder, with more than 50 years of measurements of the atmosphere. A team of scientists at New Zealand’s National Institute of Water and Atmospheric Research (NIWA), led by Dave Pollard, run the station. The station is part of NASA’s Total Carbon Column Observing Network (TCCON) and hosts a spectrometer that looks at the sun and, by looking at the part of the light spectra that is known to be absorbed by carbon dioxide, measures the total amount of carbon dioxide in the atmosphere. TCCON was designed and implemented for NASA by Paul Wennberg of Caltech to help calibrate the Orbiting Carbon Observatory satellite. Our aircraft measurements provide a direct link between the measurements that scientists make by sampling air at the ground and the measurements made by satellite and the TCCON looking at sunlight. On the airplane we measure samples of air, just like sampling on the ground, but we can take those samples along most of the path from the ground to the top of the troposphere, getting the total amount of carbon dioxide for the whole column, which the TCCON sites measure. 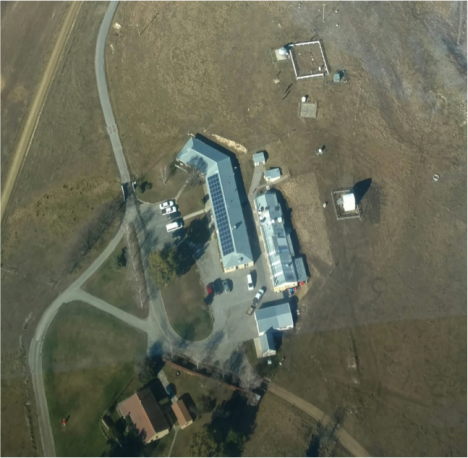 My group have done these type of measurements all over the world, starting in 2004, and we have been to Lauder five times before, but never have we had such a clear day as we did on this flight. Correction: Aug 19. The Goddard weather forecaster was misidentified in the original post. It has been corrected in the text. This entry was posted on Tuesday, August 16th, 2016 at 3:25 pm and is filed under ATom: World Survey of the Atmosphere. You can follow any responses to this entry through the RSS 2.0 feed. Both comments and pings are currently closed. I have been across that ITCZ several times in a sail boat. The random “lumpy” waves down there on the surface accurately mirror those clouds up topside. Combined with the lack of any consistent wind power I can see how the doldrums got a bad reputation, shake the heck out of your rigging and not much progress without the diesel pounding away.